Get Great Benefits with Fredericton VW’s Customer Referral Program! When you refer a friend, you’ll enjoy $300 towards Volkswagen parts and service with us at Fredericton Volkswagen! Thank you for purchasing a vehicle from us at Fredericton VW. There could have been a number of reasons why you decided to do business with us. We might have been the best price, you might have exclusively been looking for a Volkswagen, or maybe it was our approach to the car business that convinced you to buy your car from us. Whatever the reason, you picked us and we believe that says something. Every year, Fredericton VW spends a significant amount of money marketing and advertising our services. It occurred to us that we don’t need to spend this money if we can convince people who are already doing business with us to talk to others on our behalf. For every person you refer to Fredericton VW who eventually buys a vehicle from us, we’ll provide a referral gift to you. 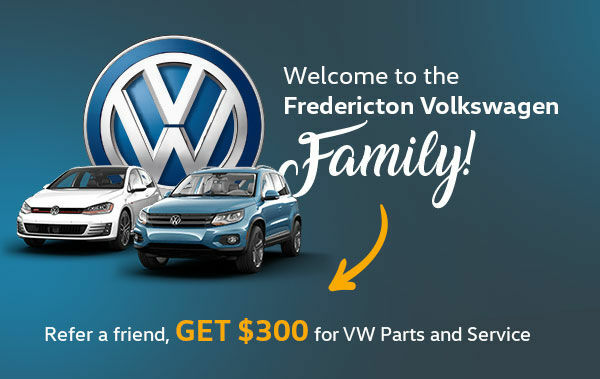 We will give you $300 to be spent at Fredericton VW towards the maintenance of your vehicle or the purchase of part and accessories. We believe that if we spend our money on satisfied customers rather than traditional marketing, not only will Fredericton VW continue to grow but our customers will also receive a few benefits! Imagine… all you need to do is let the people around you know that you had a good experience with Fredericton VW and it could result in a few dollars coming your way. You need to let us know who you are referring prior to them visiting the dealership or purchasing a vehicle. You can either email your referral to referral@frederictonvw.com or email your sales consultant directly. You can call any of our staff to let us know how to contact your referral and what vehicle they might be looking for. The person you refer to us must be new to the Fredericton VW family. They must not have done business with us in the past. The gift we are providing has no cash value and may only be used towards service, parts and accessories purchases at Fredericton VW. The gift must be used within two years of earning it otherwise its value will be retired. We look forward to the benefits of a successful program. Check out our website for current specials at frederictonvw.ca.